Our IEE cable sizing was wrote a few years ago and had become rough around the edges. I thought it was time to give the tool a service. Unfortunately when I looked under the hood I found cracked cylinders, broken bell ends and worn cylinders. Rather than a quick service I had no choice be to do a major rewrite on the software. The only thing I didn't touch is the chassis [database], which while suffering from patches of rust, was still usable. things should be a lot quicker. The number of postbacks has been minimized (unfortunately a few are required to retrieve cable configuration data). Calculation of the cable size itself has been improved to make the processing more efficient. everything is all on one page. A slicker user interface with no more switching between tabs. you now have quick access to the underlying data. Click any of the 'i' buttons on the form and the relevant data table should pop up. Of all the software tools on the site, the cable sizing one is the most complex. A lot of the complexity derives from strictly following the Wiring Regulations, which while designed for humans to work through, are not necessarily software friendly. Hopefully the tool should be working well, but if you do come across and bugs or have any suggestions, please let me know. 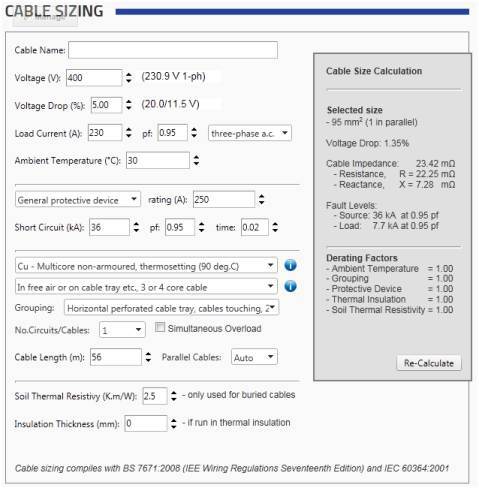 Click here to give the Cable Sizing Tool a try. i noticed when i try to size cable for small load, the software keep giving the wrong size, i.e for 12 Amp load, 380V, protected by 16 Amp, the cable calculation software will give 35mm2 which is wrong. I have just tried your scenario (with XLPE cable) and at 25kA fault, 25m2 was required, but at 1kA fault only 1mm2.